Once of the most interesting, historic, centrally located, and rustic Off the Tourist Path places to visit in Italy is the cliff-top,village of Pitigliano in the Grossetto district at the southernmost border of Tuscany. Located about a 2-1/2 hour drive from either Florence or Rome, this is a perfect place to use as a base for a longer (2-3 week stay) in Italy. There are an amazing number of unique things to do and see in the immediate area, and day trips to Rome, Florence, Pisa, Siena or other Tuscan towns are very doable. The town was literally carved from the volcanic tufa rock it sits upon, with the entire town sitting above a series of tunnels and caves containing wine cellars, underground chapels, shrines, tombs and barns. Many of the homes are hybrid in this respect, some rooms are essentially caves carved from the mountain, while other rooms were built of stone on top of the cliff. Pitigliano and its area can be considered the heart of Italy, where the Etruscans lived around 800 BC, long before the Ancient Romans. It is said that many of its structures today date from the Middle Ages, circa 1000 BC. In the 13th century, its medieval life was supported by the noble Aldobrandeschi family and was the capital of the surrounding countryside. In 1293 its rule passed to the Orsini family, which began a 150 year war with the feudal state of Siena. 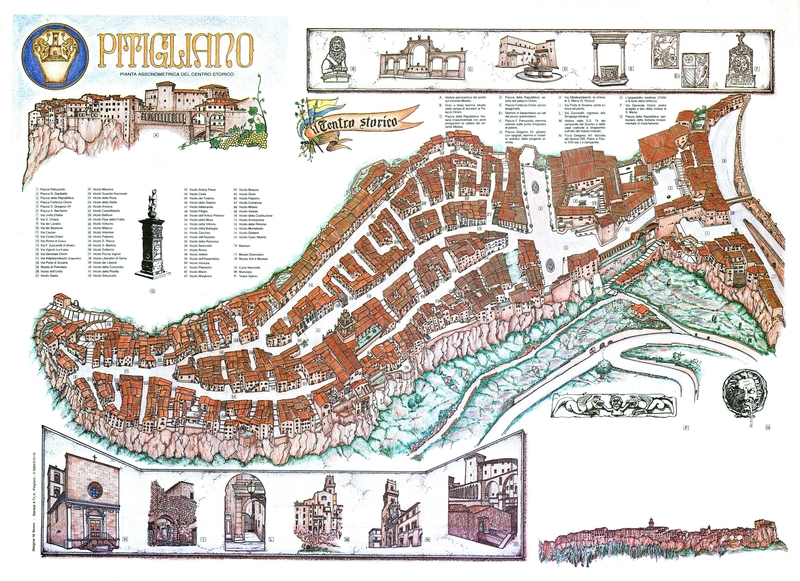 In 1455, Pitigliano was placed under the sovereignty and protection of Siena. Later on, it fell under the rule of the Grand Duchy of Tuscany (1562), and finally united with the Kingdom of Italy. Pitigliano, has been a home to Jews as early as the end of the fifteenth century. This tiny state allowed the refuge of several Jewish families, who worked primarily as money lenders. There were enough Jews to afford the construction of a Temple in 1598. In the seventeenth century, however, the Medici and the Grand Duchy of Tuscany ordered that the Jews be confined to a ghetto. Soon after, realizing the Jews contribution to their economy, the Jews were given more privileges, including the right to own property. There was a steady migration of Jews from surrounding communities and the Jewish population grew. By the eighteenth century, Pitigliano had the only remaining Jewish community in Maremma in south-eastern Tuscany. After this, the coexistence of of Christians and Jews was so entwined in the town, that it was given the nickname of Little Jerusalem. Since the time of the Etruscans, the Via Cava were carved from the volcanic tufa rock to connect villages in the area of Pitigliano for trade. Many are original from Etruscan times, while others have been continually carved and deepened either by man or erosion. These are amazing roads to travel, often appearing as chasms 50 feet deep, and others winding through leaning cliffs causing the trekker to ponder what lies around the next turn. Today, Voyagers can visit and hike the caves by foot, ride through on mountain bikes or go on horseback. You will find a mix of Etruscan history, early pagan and Christian tombs and chapels, and more. Well worth a visit: the Citta del Tufo Archaeological Park. In the surrounding area, there is a lot to see. The nearby villages of Sovana and Sorano are connected by the Via Cava and although they are both tiny villages, have a lot to offer. Sovana's roots go back to the Etruscans and it was a Roman municipality in the 5th century AD. On the high rocca of the hilltown you will find the Aldobrandeschi Castle, an Etruscan/Roman fortress castle. Another must-see is a beautiful example of a Romanesque church, the Santa Maria Maggiore and the even earlier medieval Sovana Cathedral from the 11th century. You will love strolling the narrow alleys while enjoying the mix of medieval and Renaissance architecture. Along the way are a good mix of shops and cafes. Little is know about the beginnings of Sorano but its roots more than likely are with the iron age Villanovans, with Etruscans coming soon after. During Roman times, there is little known of the village, but in 862 AD came under the protection of the Aldobrandeschi family. The main sights are the Rocca degli Orsini (Castle Orsini) and the Masso Leopoldino, a terrace atop the natural outcrop of the mountain that was carved to appear like a massive fortress from a distance by Gran Duke Leopold. It has all the defensive looks of a fortress without all the expense of soldiers and weaponry. Genius. Below the town are beautiful stretches of the Via Cava and many archaeological sites. If you stay in Pitigliano for an extended period, there are many side trips and day trips you can take. A little more than a half-hour's drive away is Saturnia, a natural hot spring--with both formal chic spas and natural springs that locals use for free. Another half-hour to the east is the lake town of Capodimonte, the largest town on the banks of Lake Bolsena, an 8 mile wide lake in an ancient volcano's caldera. And winin an hour and a half drive you can visit the wine towns of Montalcino, Montepulcino, and Pienza of Pecorino cheese fame (and our choice for a "perfect" Tuscan village). If you're a romantic and want to experience the Under the Tuscan Sun (video on Amazon) lifestyle in Cortona (even though it's VERY touristy due to the film), it's about a 2 hour drive from Pitigliano. And you're about 1 hour from the 6000 foot tall Monte Amiata, where you can ski in winter and enjoy hiking and mountain biking in summer.